Every organization has a set of rules and regulations that need to follow. These set of rules and regulations help maintain the decorum and the work environment of the organization. There are times when employees fail to follow the rules and regulations and either intentionally or unintentionally takes actions that compromise the protocol of the organization. Such employees are to be given a warning notice which would caution them about their actions and for the future, warn them that if it happens again, there might be strict actions. 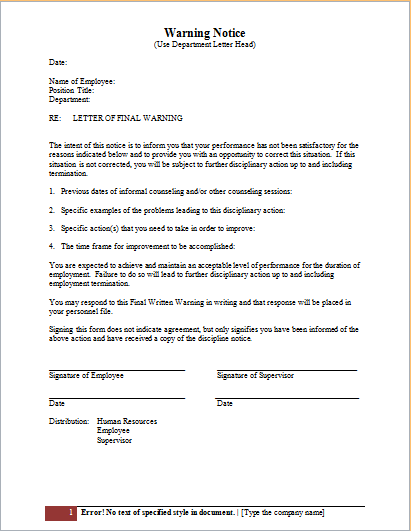 The Employee warning notice should be drafted by the manager or the supervisor of the employee in question so that the employee feels that a direct warning has been given. The tone of the warning should be formal and a bit strict. Be extra careful that the tone doesn’t get too harsh as it may scare off the employee instead of achieving the goal in mind. It should be written with utmost respect as to not demotivate the employee. 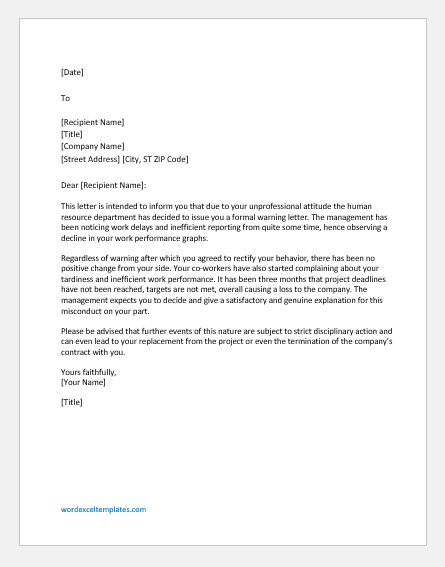 The reason behind giving the warning notice should also be mentioned along with actions that should be taken by the employee to rectify the mistake. The notice should also inform the employee about future implications if the action was to be repeated. It is vital that no information should be held back from the employee so that he/she is fully aware of the consequences. If the employee needs to pay a penalty, then that should be mentioned very clearly as well. This letter is intended to inform you that due to your unprofessional attitude the human resource department has decided to issue you a formal warning letter. The management has been noticing work delays and inefficient reporting from quite some time, hence observing a decline in your work performance graphs. Regardless of warning after which you agreed to rectify your behavior, there has been no positive change from your side. Your co-workers have also started complaining about your tardiness and inefficient work performance. It has been three months that project deadlines have not been reached, targets are not met, overall causing a loss to the company. The management expects you to decide and give a satisfactory and genuine explanation for this misconduct on your part. Please be advised that further events of this nature are subject to strict disciplinary action and can even lead to your replacement from the project or even the termination of the company’s contract with you. It is hereby to inform you that I am writing you this last notice for poor performance. A manager has sent me your reports related to poor performance in the company. We have lost our two important clients due to your negligence in making the wrong reports on the previous project. They have lost trust from us and not willing for even revisions. This is the last warning. If I got such a complaint again then we will expel you from the office. Be careful, otherwise, you will be responsible for the consequence. I am observing for many days that you remain absent off and on. Last month you did two holidays without informing and then last week you also remained absent for three days. You remain absent without providing application or sending a leave message. This is not a professional way. You must be punctual in office and in case if you are not coming to the office then inform us by sending a proper application or at least message to your manager. This is your last warning notice. If you will remain absent without informing, then the company may take action and may fire you from the job. I have got the biometric attendance sheet today and observed that you came in the office late continuously from 10 days. Furthermore, you do not come to office on time. The company does not allow to come late and consider it as absent if you come to office late for continuously three days. Therefore, it is to inform you that be on time. This is the last warning notice for tardiness. If you do not follow the company’s rule you must bear the possible consequence in terms of suspension or even termination. I have received complaints from the employees regarding your unprofessional behavior, I took it lightly. Yesterday, I received a call from the client that you do not respond to his call and messages. He is asking for the previous project files, but you are not providing him rather ignoring his messages. This is unprofessional, and company will not bear this. I am sending you this warning notice, it is good to behave professionally, and I must not receive such a complaint again. In case if I got such a complaint again then I will take serious action and maybe you have to lose your job. Be careful next time.